Internationally famous oceanographer Steve Zissou (Bill Murray) and his crew - Team Zissou - set sail on a expedition to hunt down the mysterious, elusive - possibly nonexistent - Jaguar Shark that killed Zissou's partner during the documentary filming of their latest adventure. They are joined on their voyage by a young airline co-pilot who may or may not be Zissou's son (Owen Wilson), a beautiful journalist (Cate Blanchett) assigned to write a profile of Zissou, and his estranged wife and co-producer, Eleanor (Anjelica Huston). They face overwhelming complications including pirates, kidnapping, and bankruptcy. Oscar(R)-nominated writer-director (Best Original Screenplay, The Royal Tenenbaums, 2001) Wes Anderson has assembled an all-star cast that also includes Williem Dafoe, Jeff Goldblum, Michael Gambon, Noah Taylor, and Bud Cort in this wildly original adventure-comedy. $113.085 thousand on 2 screens. Another in a series of quirky little character pieces from director Wes Anderson, 2004’s The Aquatic Life with Steve Zissou concerns the adventures of the title character (Bill Murray), a sea explorer who used to be a huge star but who’s faded from the limelight. Along with wife Eleanor (Anjelica Huston) and a regular crew that includes longtime assistant Esteban du Plantier (Seymour Cassel) and Klaus Daimler (Willem Dafoe), Steve creates short films that document their exploits aboard their ship the Belafonte. Tragedy strikes when a vicious fish Zissou dubs a “leopard shark” attacks and eats Esteban. Zissou plans to track and kill the offending fish to get revenge. Along the way, we meet Steve’s longtime competitor - and Eleanor’s ex-husband - Captain Alistair Hennessy (Jeff Goldblum) and Steve’s financier Oseary Drakoulias (Michael Gambon). Zissou meets Ned Plimpton (Owen Wilson), the son of Katherine Plimpton, an old flame of Steve’s. It looks like Zissou might be Ned’s dad so they spend time together and Steve offers Ned a spot on his team. A few others come along for the ride as well. Pregnant but single Jane Winslett-Richardson (Cate Blanchett) gets an assignment to write about Zissou for Oceanographic Explorer., and bond company stooge Bill Ubell (Bud Cort) comes along to make sure the film stays on budget. After a long prelude, the team starts the expedition, but not before Eleanor gets fed up with things and leaves Steve. A love triangle of sorts develops when it becomes clear that both Steve and Ned feel romantic interest in Jane. The movie follows that character path as well as the adventures on the trail of the shark; other action occurs along the way. Is it too early in Anderson’s career to classify him as a 21st century Woody Allen? Both create character-centered films that attract stellar talent but don’t rack up a lot of money at the box office. 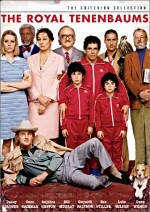 Tenenbaums is Anderson’s biggest hit, and it took in only $52 million. Despite its star power, Aquatic made a mere $24 million. I have a feeling Anderson will likely remain a niche filmmaker since his movies are just too quirky to appeal to a mass audience. Not that I see that as a problem, for Anderson’s films remain true to themselves and generally succeed. Note the “generally” in that last sentence, for Anderson’s flicks always suffer from a little too much self-indulgence. They teeter on the precipice of preciousness and veer dangerously close to becoming too cutesy for their own good. By “cutesy”, I don’t mean that they’re overly sentimental or try hard to be adorable. Instead, they indulge in a form of self-conscious quirkiness that can make them a bit annoying. Case in point for Aquatic: the film’s use of David Bowie songs. I adore Bowie’s music, and occasionally Anderson utilizes the tunes in an effective manner. For example, “Life On Mars?” swells nicely during on early scene. Unfortunately, Anderson chooses to use actor/singer Seu Jorge - who plays Belafonte crewmember Pelé dos Santos - as something of a Greek chorus. He does acoustic versions of Bowie songs translated in Portuguese. This feels almost like the Jonathan Richman character from There’s Something About Mary; Jorge doesn’t directly comment on the action, but the role comes across in a similar manner. I didn’t like Richman’s work in Mary, and the use of Jorge quickly turns tiresome as well. Despite that consistent annoyance, Aquatic offers a lot of entertainment. You might not realize that as you watch the film’s first act, as it takes a while for the piece to warm. Part of this comes from the need for exposition, and the movie plods somewhat as it sets up the characters and situations. Even so, it progresses a bit more slowly than we’d expect; the circumstances aren’t very complicated, so it shouldn’t take so long for the tale to get into gear. Once it does, though, Aquatic becomes enjoyable, at least if you like Anderson’s style. The flick includes the standard languid pacing and quirky characters. Either you dig his quiet oddness or you don’t. Actually, I suppose it’s not that cut and dried. I’ve liked Anderson’s past efforts to a moderate degree. 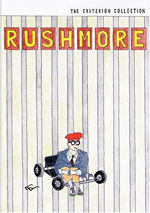 If you look at my reviews for Rushmore and The Royal Tenenbaums, you’ll find tentative recommendations. Both have their merits but suffer from too many inconsistencies. Ditto that for Aquatic. The film tosses out enough odd cleverness to maintain my attention, and it also improves as it progresses. That also seems to be another Anderson MO. Rushmore, Tenenbaums and Aquatic all need time to develop; their second halves are definitely strongest. That’s largely because they coalesce emotionally during those portions of the film. The first acts stand as rather broad, but things congeal as the movies progress. Actually, in the case of Aquatic, things go sort of nutty during the flick’s second half. More of an action film than Anderson’s others, it tosses in pirates and other adventures. Of course, these stay somewhat small scale, as Anderson doesn’t suddenly turn into Michael Bay, but they open up matters in a surprising - but effective - manner. Emotionally, however, Aquatic comes together in its second half. Bonds intensify and the characters develop. The combination of the greater depth with the quirky action allows the film to blossom. Maybe someday Wes Anderson will direct a fully satisfying flick. The Life Aquatic with Steve Zissou isn’t that film, but it musters enough entertainment to succeed. It hooks you in slowly and ends up as a winning effort. 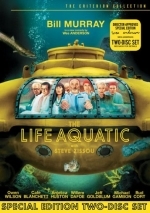 The Life Aquatic with Steve Zissou appears in an aspect ratio of approximately 2.35:1 on this single-sided, double-layered DVD; the image has been enhanced for 16X9 televisions. For the most part, the picture looked quite good, but a few problems kept it from achieving greatness. Sharpness generally appeared strong. The movie usually seemed crisp and well defined. A few wide sequences displayed a slightly soft appearance, but those occurred infrequently. Most of the movie looked detailed and accurate. Jagged edges and shimmer created no problems, but I did discern a smidgen of edge enhancement. Print flaws seemed absent. I saw no signs of grain, speckles, grit or other concerns; the movie looked clean and fresh. Colors provided one of the film’s strongest aspects. The tones always remained solid, and the hues often seemed absolutely brilliant. The movie featured a wide array of vivid and lively colors that the DVD replicated with excellent richness. Black levels also appeared deep and dense, while shadow detail was appropriately heavy but not overly opaque. Ultimately, I felt pleased with the picture quality of Aquatic. The Life Aquatic with Steve Zissou offered both Dolby Digital 5.1 and DTS 5.1 soundtracks. I won’t call this overkill, since I always appreciate the extra effort, but I detected no difference between the two. Aquatic provided a simple auditory experience that didn’t exactly stretch either format. The soundfield maintained a heavy emphasis on the forward speakers. Within that spectrum, music demonstrated positive stereo imaging. Otherwise, the effects showed some general sense of atmosphere but little else. Scenes on the sea presented mild elements like waves and whatnot, and the surrounds contributed just some reinforcement during underwater bits. The scope remained quite limited, though it broadened as the flick progressed. The mix never became scintillating, but it opened up with rain, music and other elements during the second act. With one notable exception, sound quality seemed fine. Dialogue varied. Some lines were natural and distinctive, but many parts sounded dense and wooden. This occasionally affected intelligibility, as speech could be tough to make out at times. Effects were a minor factor, but they seemed accurate and clean. Music presented a more substantial element, and those elements appeared reasonably vivid and bright, with decent low-end response. In the end, Life Aquatic offered a fairly subdued soundtrack that worked fine for the material. Packed onto this two-disc affair, we discover a mix of extras. 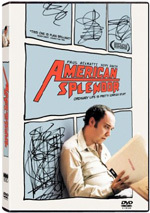 On DVD One, we begin with an audio commentary from director Wes Anderson and co-writer Noah Baumbach. Both sit together for this running, screen-specific discussion. Apparently the pair wrote the flick at a New York restaurant, so that’s where they recorded the commentary. This is a bad choice, as all the background noise creates a consistent distraction. Despite that annoyance, this stands as a strong commentary. The pair go over the characters and casting, working with the actors and the atmosphere on the set, influences and inspirations, sets and locations, visual effects and music, screenwriting and their collaboration, and many other bits about the shoot. The track starts a little slowly, but it soon transforms into something quite positive. The piece only occasionally suffers from dead air or happy talk, as the majority of the chat focuses on insightful and useful topics. The noisy setting remains an annoyance, but the commentary gives us more than enough good material to overcome that obstacle. One oddity: during the early part of the track, Anderson and Baumbach refer to an inspiration who clearly is Jacques Cousteau. However, the explorer’s name is consistently bleeped out whenever it appears. This must be for some legal reason, but it seems weird. Nine deleted scenes last a total of four minutes, 34 seconds. Since that means an average running time of about half a minute, don’t expect anything too substantial here. Some amusing tidbits appear, but they remain minor excisions that fail to offer a lot. In addition to the movie’s theatrical trailer, we get a Starz On the Set featurette that goes for 14 minutes and 31 seconds. This is the usual promotional piece that mixes movie snippets, behind the scenes footage, and interviews. The latter include remarks from Anderson, director of photography Robert Yeoman, producer Barry Mendel, production designer Mark Friedberg, stop-motion animator Henry Selick, editor David Moritz and actors Owen Wilson, Cate Blanchett, Anjelica Huston, Bill Murray, Jeff Goldblum and Willem Dafoe. They chat about the movie’s origins and plot, the cast and characters, Anderson’s style, the Belafonte and the film’s fake aquatic life. Some of the notes about the cast offer mild insight and we get a good look at the Belafonte set, but this remains little more than an attempt to tout the flick. With that we shift to DVD Two, where we open with Seu Jorge Performs David Bowie. This 40-minute package shows outtakes from the shoot, as we watch the unedited clips of Jorge as he plays 10 Bowie tunes. In addition to the music, we see candid moments before and after Jorge does his thing. I still don’t care for Jorge’s takes on Bowie, but this is a nice bonus anyway. Inside Photos we discover - surprise! - a picture gallery. It includes 170 shots, most of them taken by set photographer Philippe Antonello; we also get a few Polaroids by Anderson. Antonello’s shots come from the set and are unusually elegant and attractive. Next comes a five-minute and 29-second featurette called The Look Aquatic. It presents comments from production designer Mark Friedberg and producer Barry Mendel. They talk about design challenges such as sets and the Belafonte as well as the movie’s general appearance. He gives us nice insight into his work and the choices made in this short but tight program. The seven-minute and 53-second Aquatic Life looks at the film’s undersea creatures. We hear from visual effects supervisor Jeremy Dawson, sea creatures supervisor Martin Meunier, fabricator Daren Rabinovitch and stop-motion animator Henry Selick. We learn about the methods used to bring the movie’s imaginary critters to life, as we check out design elements and the technical work. “Life” covers the subjects in a concise and informative manner with plenty of good behind the scenes footage to flesh out the remarks. I especially like the demonstration from Meunier as he shows us the workings of the puppets. Another still gallery appears via Designs. It presents 15 images. Some are close-ups of elements seen in the film such as the Zissou movie posters and pinball machine, while others provide glimpses of concept sketches and designs. Despite the section’s brevity, it offers some cool material. Simply titled Ned, a two-minute and 55-second featurette includes outtakes and comments from actors Owen Wilson, Bill Murray and Cate Blanchett. They discuss the character and give some insights into his personality as well as thoughts about Wilson’s acting style. The outtakes are good and Murray tosses out a couple of funny quips, but we don’t learn a whole lot here. In a similar vein comes Esteban. This seven-minute and eight-second piece acts as a video journal that follows actor Seymour Cassel around Italy. We see him flirt with a young woman, buy cigars, get a bald cap placed on his head, rehearse, and shoot some scenes. During candid situations, he also chats about his prior film experiences and other activities. The shots from the set work the best, as it’s fun to get a glimpse of the production’s underwater elements. For one more actor-based program, we go to the three-minute and 27-second Jane. It presents remarks from Blanchett, Anderson and Mendel. Better than “Ned”, “Jane” offers a few character insights but focuses mostly on Blanchett’s approach to the role and her experiences, with an emphasis on how her real-life pregnancy affected things. Some nice outtakes round out this good little piece. With a running time of four minutes and 40 seconds, Creating a Scene concentrates on an early cocktail party segment with more behind the scenes footage and comments from Anderson, Murray, and actors Anjelica Huston, Willem Dafoe and Jeff Goldblum. We learn a little about Anderson’s methods, but once again, the candid footage works the best, especially when the actors interact with the director. We take a look at the movie’s composer with the Mark Mothersbaugh featurette. This 19-minute and three-second interview covers Mothersbaugh’s relationship with Anderson and their interaction, the sound of the movie’s music and its cheesy synthesizers, transitioning from Devo to film composing, “musical palindromes”, his use of electronic instruments in Aquatic, references to classical compositions, instrumentation, his studio, and his feelings about outside songs used in the movies. Mothersbaugh provides a rich look at his work as he chats about Aquatic as well as past collaborations with Anderson. In addition, you gotta love a guy who lets his dog sleep on his lap during an interview. A documentary called This Is an Adventure lasts 51 minutes and 22 seconds. Comprised of footage from various parts of the production, it includes no narration or formal interviews; participants might make asides to the camera, but they don’t ever chat with the documentarians. And that’s cool with me, as I love this kind of “fly on the wall” piece. We see Murray go through costume, makeup and wig tests and also check out many aspects of the shoot. The majority of the program concentrates on interactions between Murray and Anderson. Of course, others pop up along the way, but those two dominate this entertaining piece. We get a great look at various aspects of the production and find a cool glimpse at the reality of the shoot. Costumes presents a four-minute and 36-second featurette with an obvious focus. It includes remarks from Mendel, Huston, Blanchett, Wilson, Dafoe and actor Bud Cort. It seems odd that we don’t hear from the flick’s costume designer, but the parties involved provide some nice details about their outfits and how they interact with the characters. From an Italian talk show, we get Mondo Monda. The 16-minute and 22-second piece provides an interview of Anderson and Baumbach conducted by Antonio Monda. (You’ll recognize Monda as the movie’s “festival director”; he’s actually the first person we see in Aquatic.) Monda asks pretentious questions about how the film can change the world and whether the film is anti-feminist. Methinks this is a put-on and a staged interview to make fun of similar sessions, and as such, it’s moderately amusing. The Intern Video Journal was shot by Matthew Gray Gubler and goes for 15 minutes and 20 seconds. Gubler narrates this piece, which otherwise consists of more candid footage from the set. It complements “Adventure” and doesn’t feel like a retread of the same sort of material, mainly because the “Journal” concentrates more on leisure time activities. It provides a fun little look behind the scenes. Finally, the package comes with a 10-page foldout booklet. In addition to a large diagram of the Belafonte, this includes an interview with Wes and his brother Eric Chase Anderson, an illustrator. They discuss pieces of art in various films and make this an inconsequential but entertaining chat. The Life Aquatic with Steve Zissou falls into the category of quiet, unassuming movies. Sure, it goes for an action bent at times, but it doesn’t overshoot its boundaries as it remains mostly soft and quirky. It takes a while to get going, but by its conclusion you realize you’ve seen something very good. The DVD offers mostly positive picture quality along with fairly average audio and a terrific package of extras. If you’re in the mood for this sort of idiosyncratic character piece, I recommend it. Note that two versions of Aquatic are on the DVD shelves. There’s this two-disc version along with a single-platter edition. The latter apparently includes this set’s first DVD and simply drops the second disc. Since the one-DVD release retails for a mere $3 more than the more deluxe version, I’d definitely recommend the latter.